First-time visit or new to the parish? We hope the questions and answers below will help you to feel at home when you come to our parish! If you have any unanswered questions, please do not hesitate to contact us. How do people dress for Mass? We know that this is an important question for many people who want to fit in. When you attend Mass at Our Lady of Grace you will notice that there is a wide variety of clothing choice from “office casual” to dresses, shirts and ties, to jeans; some even wear shorts of appropriate length and sandals in the summer. We would like you to feel comfortable, so that you can focus on our celebration of faith, but not too comfortable, to reflect our reverence for worship. Our parish grounds offer 240 parking spaces in 7 lots that span 5 different levels that have a few steps between them. For those who need handicap-accessible parking, our grounds include 28 handicapped designated parking spaces by the accessible curb. As is typical at a Catholic Church, you can expect Mass to be between 55-65 minutes. How early should I arrive for Mass? With the exception of Christmas and Easter, people arrive to Church anywhere from a half hour to 10 minutes prior to Mass based on their individual and family needs. If you require special seating or parking, it is suggested to arrive at least 20 minutes prior to Mass, otherwise there is always an open seat. We welcome children of all ages to join the celebration of the Mass. When you look around at the people gathered, you will see newborns to those in their 90s and every age in between. Our weekly Mass is truly a multi-generational gathering! For parents who worry when their child cries during Mass, please know that you are not alone. You are always welcome to step out into the gathering space to walk the child and return when you have comforted them. 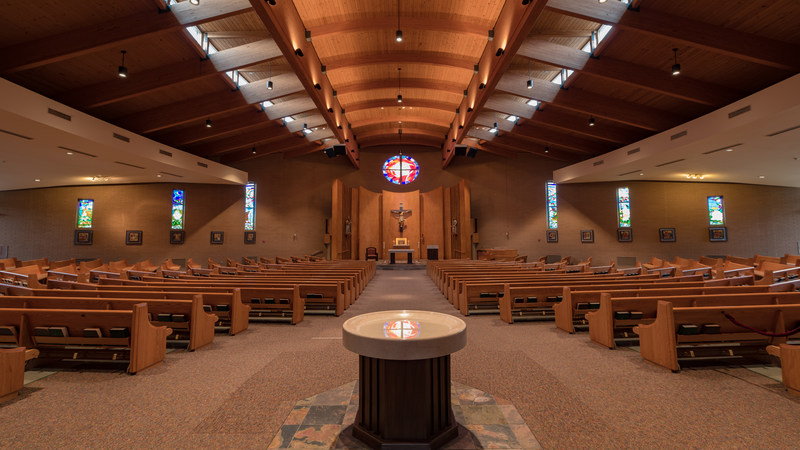 While in the gathering space you will still hear the Mass through a speaker system. In addition, we offer changing stations in our restrooms for your convenience. During September through May our parish offers Faith Formation for children in PK-5th grade on the second and fourth Sundays of the month. For teens, we offer a Middle School Youth Ministry for those in grades 6-8 on Wednesday nights and a High School Youth Ministry for those in grades 9-12 on Sunday nights. For more information, visit our Formation and Evangelization pages. However, you don't have to take our word, read about one young family's experience worshiping at Our Lady of Grace! Click here for the article. We are excited to offer a weekly Mass that is American Sign Language interpreted. Anyone in need of this service is invited to the Sunday 10:30 a.m. Mass. In order to properly see the interpreter, you are invited to sit in the reserved pews in the center right section by the organ and choir area. Do you have Mass in Spanish? While we do not offer a Mass in Spanish, we do have a large Hispanic community at our parish that is constantly growing. At times, we offer small faith-sharing groups in Spanish. If you are interested in connecting to this community, please contact Katrina Coleman at kcoleman@dioceseofgreensburg.org. What kind of music is played at Our Lady of Grace? At our parish, we do not have music-specific Masses (i.e. a contemporary Mass, a folk Mass, etc). Instead, we seek to include a variety of music in our celebrations - from traditional hymns with organ, to chant, to contemporary Christian music such as Matt Maher and Chris Tomlin. Our music is offered by a choir, individual singers, and instrumentalists, depending on the Mass time or celebration.